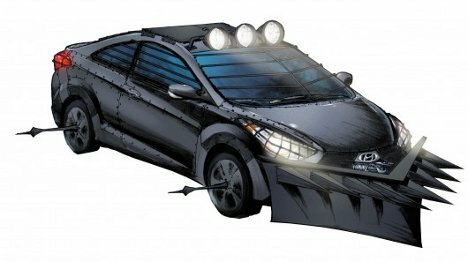 If you’re like us and you can’t get enough of The Walking Dead and other zombie fiction, you’ll no doubt be super-excited for Hyundai’s zombie apocalypse car. Created by The Walking Dead creator Robert Kirkman, the concept car is set to debut at Comic-Con and, from the looks of the concept drawings, is going to be crazy awesome. Above, Kirkman describes part of the creative process and details a few of the car’s zombie-slaying features. Spikes on the sides and front, a scoop to push bodies out of the way and a sunroof gun turret are just a few of the cool features meant to keep people inside the car from being eaten by the undead. It’s all based on a Hyundai Elantra which is being souped up and tricked out just for geeks like us to drool over.